After a few weeks galavanting around the cosmos, Kalani and Sunshine have plopped down in front of the microphones @ ZTL studios to record a podcast before we pack the car for Mod-Palm Springs. For starters, our cocktail is more of an un-cocktail that anyone can make. Listener Alexa asked for some recipes of easier make at home tiki drinks. Sunshine was happy to oblige with his thoughts on how to make tasty polynesian inspired drinks without even measuring or using a recipe. Combine in a mixing glass and taste. Add citrus (lime or lemon), add a syrup like (simple or cinnamon or passion) to balance the sweet/sour of the drink. Add small amounts of citrus and syrups, these are for balancing only. Lastly, add ice to the mixing glass, shake well and strain or pour into a glass filled with ice. Most of the flavor should come from the juices and rums. By making a cocktail with no real recipe you will learn how to balance a drink. If you like it more sour, then more citrus. If you like it sweeter, obviously some more of the syrups. Listen to the show for even more tips on how to make this work and impress your friends. In response to a listener question there was a need to be serious for a few moments. Specifically, what to do with a "friend" who is known for drinking too much and causing trouble. Kalani and Sunshine share a similar opinion. Frankly speaking, anyone who serves someone else a drink needs to be ready to deal with those consequences and be ready to call a drunk a drunk. For the full Monty, listen to the show. Music in this weeks show is a little all over the place. We start with trying out iTunes radio to see how well you can build an exotica play list. You be the judge. Friend of the show Kym Nagler sent us a sample of tunes from GT Stringer, a sweet spaced out surf rock band from down under. Kym is an artist himself, check out his art and woodworking skills that show off his love of Polynesian kitsch. Akymbo Art. Additional music by Marty Lush and his Latin Livers, whom you can hear at the upcoming Mod-Palm Springs event October 11-13 in Palm Springs. And we toss in two very random tunes from Truus and Clouseaux. As we dive deeper into our inebriated state Sunshine has the opportunity to share a story of half awake dream state that he encountered on a trip to the local casino. What do you get when you mix a half dozen cocktails over an evening and little sleep? A very bizarre dream that includes witches, dragons, pooka shells, wild parties and some other odds and ends we can't even mention for legal reasons. Hear the details on this episode of the podcast. Last but not least we need to give our web store a shout. 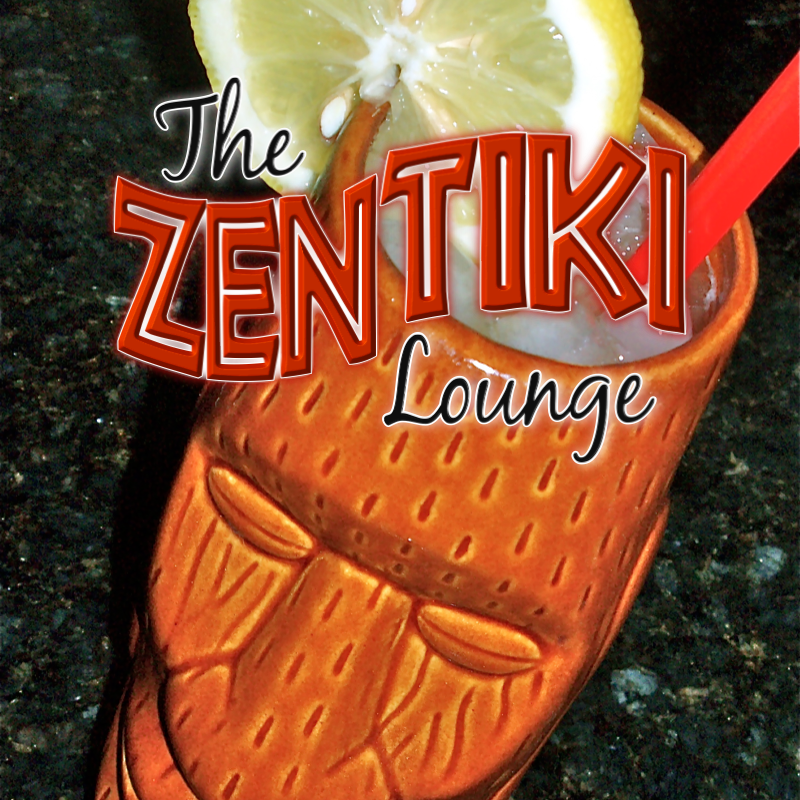 We have a very limited number of our exclusive tiki mug (Big Orange Richard) available for sale. Also, t-shirts and bar towels with our logo. Grab one of these great items to help support the show. As a special BONUS!! !, if you purchase our mug and attend Mod-Palm Springs, you and only you can have your mug filled with a super secret cocktail only available to those with the mug. Join us at either our Friday night room party or our LIVE recording of the podcast to fill your mug. Maybe even another time or two as the weekend unfolds this October 11-13.